How To Create A typical Ceker Seblak Bandung Super Spicy Favors .Snacks spicy famous and popular today in the city of Bandung many who loved both the old or the young. These snacks easy to find on the edge of the road, stands next mini market, or at kiosks that Seblak claw spicy. Seblak claw spicy is based foods from chicken claw and using spices selection. Seblak claw has a soft texture and soft so that when you bite cekernya it was soft and delicious especially the marinade to seep into her bones. This claw Seblak delicious if eaten during the day as a snack or as a friend of rice you are accompanied by a glass of ice cold sweet tea or orange. To make seblak claw is certainly very easy, but before making seblak claw is so tender and soft flavor cekernya spilled chicken should be boiled first until tender and cooked through. 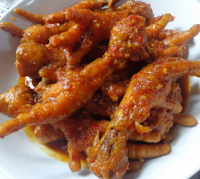 If discussed constantly there will be no end, we simply create seblak claw tasty and spicy for you can try at home. Provide fine spices such as onion, garlic, cayenne pepper, red pepper, and puree kencur these materials naturally by using a mortar. Heat the pan then add oil and saute ground spices until fragrant scent of ripe and fragrant. Put claw and water, stirring until evenly while adding more seasoning salt, flavorings, sugar and soy sauce. Stir until the marinade is absorbed and mature. 0 Komentar Untuk "How To Create A typical Ceker Seblak Bandung Super Spicy Favors"